Firefox doesn't get enough love these days, but it's still the most customisable browser around thanks the numerous options in about:config. 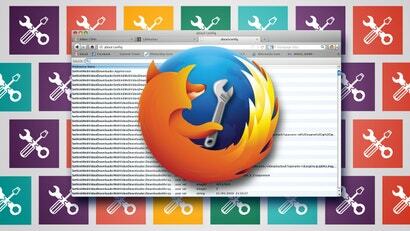 Here are 10 under-the-hood Firefox tweaks you should try out. With a few about:config tweaks, you can turn on Firefox's built-in hardware acceleration and improve both graphical performance and the look of your fonts. Firefox only: The previously mentioned BarTab extension lightens Firefox's memory load and prevents crashes—in other words, it's a great add-on. But the latest Firefox 4 betas, and presumably the final release, can do most of that with an about:config switch. Among the changes in the official Firefox 3.6 release is a change to where new tabs open from clicked links—to the right of the tab they launched from. Liked it better the old way? Here's the quick fix. Firefox only: If you've already started using the Firefox 3.6 Beta release, you're going to need more than the old checkCompatibility trick to get your extensions working again. If you frequently examine the source code of web pages while using Firefox, this handy trick will load the source code directly in your favourite editor. Firefox 3.5 includes support for the multi-touch features of the latest and greatest MacBooks, but leaves out a "twist" motion that moves forward and back through browser tabs. A quick about:config hack brings it back. In our latest browser speed tests, I half-heartedly complained that Firefox eats up memory over long periods of use. Our lovely, helpful commenters pointed out that there is, indeed, a tweak to help with that. It's important to note that this about:config tweak doesn't actually change how Firefox uses (and hoards) memory over actual use. For the purposes of user speed, then, it's not much change. But while Windows can normally grab memory back from applications that are minimised, Firefox prevents that and keeps all the memory it acquired during your multi-tab wanderings—unless you enable this tweak, which some have claimed also makes Firefox scale down the big memory pile it had going upon re-focusing. The Mozilla Links blog reports that Firefox's next release, version 3.1, will ship with colour profile support turned on by default. Colour profile support shows richer colours in certain images in your browser; if you can't wait for 3.1 to drop, here's how to enable it in your copy of Firefox 3 now. Firefox 3 comes with several preferences baked into its options dialogs, but there are still a few you can only access by rolling up your sleeves and digging into its configuration manually. Power users have been diving under Firefox's hood to get their browser to behave just how they like since version 0.9, but Firefox 3 offers some new settings that customise its new features. 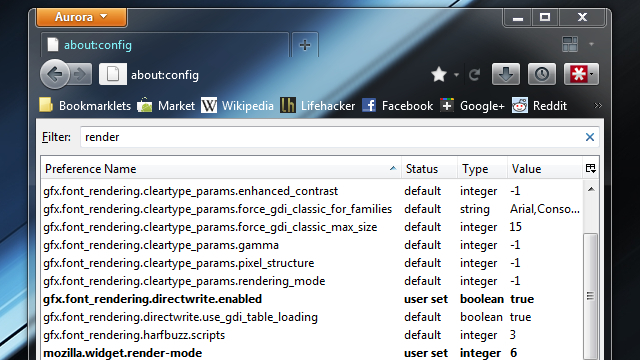 Let's take a look at our favourite Firefox 3 about:config tweaks for customising your browser. Firefox 3 doesn't store your bookmarks in the plain old HTML file that Firefox 2 did, so desktop launchers like Quicksilver and Launchy can't index them properly. But the HackCollege blog has a solution: a Firefox 3 about:config tweak that makes Firefox automatically export your bookmarks to a file. Change the browser.bookmarks.autoExportHTML value from false to true to get a bookmarks.html file saved to your Firefox profile directory each time you shut down your browser. How Do I Delete about:config Entries? In today's earlier list of five extensions you won't need in Firefox 3, we said you won't need any special toolbars, third-party apps, Greasemonkey scripts, or extensions to get Firefox to use webapps like Gmail to open certain types of links—like email mailto links. This means that when you click on an email address that uses the standard mailto: link, Firefox 3 itself can launch Gmail instead of a desktop app. By default, the Firefox RC 1 only comes with Yahoo! Mail as a possible mailto: link handler, which leaves Gmail users out in the cold—unless you know how to set it up by hand, that is. Here's how to set up Gmail as your default mailto: webapp. Weblog Daily Gyan points out a simple about:config tweak that disables the installation delay for new Firefox extensions. As you may know, Firefox tries to protect you from malicious attacks by setting up a delay before allowing you to install a new extension. But if you're confident in your browsing habits and you want to avoid the wait, just enter about:config in your address bar, then paste security.dialog_enable_delay into the filter box. Double-click that preference and change the value to 0. If you're aware of the risk but still don't feel like waiting every time you install a new extension, this is a nice time-saver. How To Disable Extension Install Delay in Firefox. Want to know where all those Firefox plug-ins (not extensions) like Flash and QuickTime actually live on your computer? An about:config tweak reveals the full file path and can help you troubleshoot runaway processes and browser crashes.